The Ottoman Empire began its march to dominance as a band of Turcoman nomads from Central Asia. Several centuries later, they were the globally dominant military, political, and economic power. Analysis of the Ottomans as a world power—especially their diplomatic relations with emerging European powers such as Portugal, Venice, and France—is not new in the historiography, but sustained monographic treatments of the Ottoman relationship with their eastern neighbors, especially the Safavids and the Mughals, have been rare. Moreover, Ottoman naval power has only recently given its proper place in the historiographical analysis. Historians such as Palmira Brummett, Andrew Hess, and Salih Ozbaran detail how the Ottomans were not only a ‘gunpowder empire’ with well organized armies; they also built and provisioned trading ships in the Mediterranean, Baltic, and Red Seas. S systemic monographic treatment of their presence in the Indian Ocean is yet to be written. 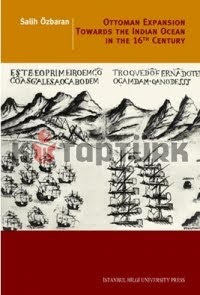 The knowledge of Ottoman presence in the Indian Ocean was initially facilitated by Portuguese historians, while on the Turkish side, the pioneering works of Salih Ozbaran have been collected in The Ottoman Response to European Expansion: Studies on Ottoman Portuguese Relations in the Indian Ocean and Ottoman administration in the Arab lands during the Sixteenth Century. Ozbaran’s work of collecting and presenting primary sources and interpretation of Ottoman diplomatic relations and naval power is particularly valuable. He details how in the late 15th century, having conquered Istanbul and established hegemony over Anatolia and several Baltic and Arab provinces, the Ottomans turned to Venetian shipbuilders to challenge the Portuguese in the Indian Ocean. At the head of the Red Sea, the Ottomans completed their new fleet, and in 1507, Amir Husayn led the fleet to fight the Portuguese at Diu. Despite their defeat by the Portuguese in 1509, the Ottomans remained a viable naval power in the Red Sea, with outposts on the Horn of Africa and control over the strategic port of Aden on the Yemeni coast. Furthermore, the hostility of the Swahili city-states to Portuguese hegemony meant that Ottoman incursions down the East coast of Africa were perceived as a real threat. In about 1585, a single Turkish ship promising support was sufficient to bring on a general revolt of Swahili towns, which the Portuguese promptly quelled. A couple of years later, Amir Ali Bey—whom some sources picture as an Ottoman official, but others as a mere buccaneer—appeared with a small force. Again, several city states immediately broke away from Portuguese control. At Pemba, the townspeople annihilated the occupying garrison, and an attack was mounted against Malindi, Portugal's staunchest ally. Again a Portuguese fleet from India restored control with appalling brutality. At Faza, they slaughtered the entire population, destroyed its vessels and plantations, and sent the head of its king as a grizzly trophy to Goa. Ali Bey returned with a somewhat larger force two years later and took possession of Mombasa. Another Portuguese relief force was dispatched, and sailed into the harbor to find the Turks had come under siege by invaders they called Zimba, reportedly a savage people who had already destroyed Kilwa. The Portuguese fleet attacked and pillaged the city, and then, as they departed, the Zimba rushed in to complete the devastation. Advancing farther north, the Zimba finally were defeated at Malindi by a force of warlike pastoralists whom the Portuguese called Masseguejos. Portugese control would continue until the Omanis (invited by Mombasa city leaders) finally wrested control of the coast from the them in 1698. Of course there are other stories here too: the conflict between the Ottomans and the Ethiopian emperor Minas over the coastal imperial stronghold of Debarwa, the intermittent treaties between the two parties over the trading entrepots at Massawa and Arkiko. During the 15th century the Ottomans had used local Muslim intermediaries to wage war against the Ethiopian emperor, while the Portuguese backed the Ethiopians but tried to make them submit to Papal authority in Rome. As both Ottoman and Portuguese power declined in the 17th century, these machinations died down. The larger point in all is that the histories of these liminal spaces on the edges of the great empires often have their own unique and compelling stories which get lost amidst the focus on a perceived 'center'. If a historian came along who knew Kiswahili, Arabic, Portuguese, Ottoman Turkish, French, German, and English, and perhaps Gujarati he or she could write a comprehensive history of the Western Indian Ocean from antiquity to the present, including some of the arcane bits of minutiae which help give life to the larger sketch. As it now stands, learning two languages is a daunting enough task, so this herculean effort is still a future endeavor for some aspiring genius. I am a Msegeju, a descendant of those warriors that defeated the Zimbas. When I was growing up my mother narrated a story to me about how some of my ancestors defeated the cannibalists and our elders erected huge stones where they defeated these cannibalists. Does any one know the exact site of the battles between the Mosssegejus(Wasegeju) and the Zimbas in Malindi? And there are few people in Tanzania or Kenya who even know if the Segejus existed, we are lumped by the Digos.